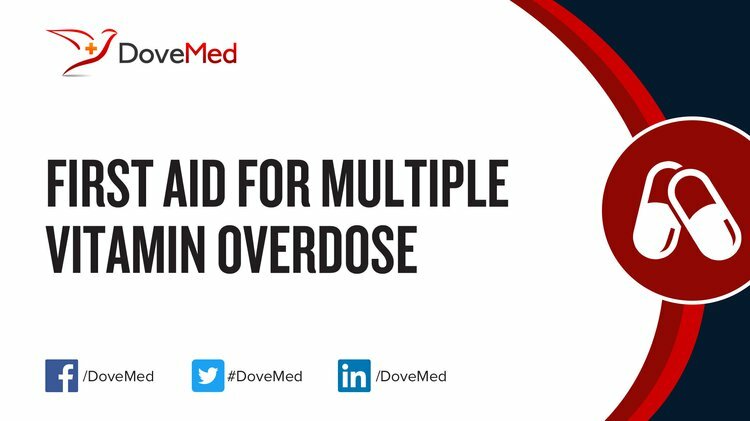 Multiple Vitamin Overdose is the accidental or intentional intake of the drug in dosage higher than prescribed values. The risk of serious harm is from excess intake of minerals such as iron and calcium. What is Multiple Vitamin Overdose? What are the Causes of Multiple Vitamin Overdose? What are the Signs and Symptoms of Multiple Vitamin Overdose? The signs and symptoms of Multiple Vitamin Overdose can vary from one individual to another. It may be mild in some and severe in others. Several systems of the body, such as the digestive system, nervous system, vascular system, urinary system, muscular system, skin and ENT may be affected. How is First Aid administered for Multiple Vitamin Overdose? Who should administer First Aid for Multiple Vitamin Overdose? First aid for Multiple Vitamin Overdose is administered by healthcare professionals. What is the Prognosis of Multiple Vitamin Overdose? How can Multiple Vitamin Overdose be Prevented? Chen, K., Zhang, X., Li, T. Y., Chen, L., Wei, X. P., Qu, P., & Liu, Y. X. (2011). Effect of vitamin A, vitamin A plus iron and multiple micronutrient-fortified seasoning powder on infectious morbidity of preschool children. Nutrition, 27(4), 428-434. Moon, J. M., & Chun, B. J. (2011). The efficacy of high doses of vitamin C in patients with paraquat poisoning. Human & experimental toxicology, 30(8), 844-850. Anık, A., Çatlı, G., Abacı, A., Dizdarer, C., & Böber, E. (2013). Acute vitamin D intoxication possibly due to faulty production of a multivitamin preparation. Journal of clinical research in pediatric endocrinology, 5(2), 136. De‐Regil, L. M., Suchdev, P. S., Vist, G. E., Walleser, S., & Peña‐Rosas, J. P. (2013). Home fortification of foods with multiple micronutrient powders for health and nutrition in children under two years of age (Review). Evidence‐Based Child Health: A Cochrane Review Journal, 8(1), 112-201. Kersey, M., Chi, M., & Cutts, D. B. (2011). Anaemia, lead poisoning and vitamin D deficiency in low-income children: do current screening recommendations match the burden of illness?. Public health nutrition, 14(08), 1424-1428. Hayman, R. M., & Dalziel, S. R. (2012). Acute vitamin A toxicity: A report of three paediatric cases. Journal of paediatrics and child health, 48(3). Audran, M., & Briot, K. (2010). Critical reappraisal of vitamin D deficiency. Joint Bone Spine, 77(2), 115-119.